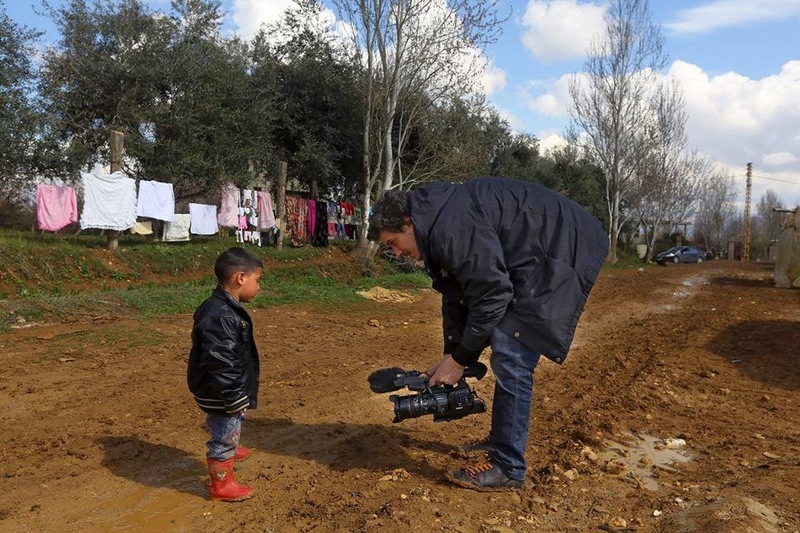 Simone on assignment in the Bekaa Valley, Lebanon, March 2014. ROME – Many of you have probably heard or read about Simone Camilli's tragic death in Gaza on Wednesday. Simone, 35, was working for the Associated Press at the time and was killed when Gaza police engineers attempted to disable an unexploded bomb. Although Simone had been working on contracts for AP since 2005, for three to five months each year between 2009 and 2013 he came to Rome and worked as a consultant in the broadcast unit of the IFAD Communications Division. He was a true team player who integrated seamlessly into the division each time he returned to us. Simone was a highly skilled editor and cameraman as well as an aspiring documentary filmmaker. He had been based in Jerusalem for several years. Working with IFAD gave him an opportunity to spend more time in his hometown, Rome, but also to explore more of the issues he felt passionately about – namely, telling the stories of those who were less fortunate than he was. During the time he worked for IFAD, Simone edited dozens of short documentaries filmed at IFAD project sites around the world. He produced his own video stories as well, travelling to both the Philippines and Sri Lanka to cover issues related to remittance flows in rural areas. Simone also worked on many internal productions, the most legendary being the first 'Men in Black' video for an Asia-Pacific Regional Division staff retreat. The comedic short was a far cry from the PowerPoints and flip charts that usually characterize such meetings, and it reflected Simone's well-honed sense of fun. In fact, despite all he accomplished at IFAD, what people who crossed paths with him here are most likely to remember are his smile and good humour. He was quite simply a good and decent human being, a pleasure to be around and a pleasure to work with. In January 2014, Simone, his life partner Ylva and young daughter Nour moved from Jerusalem to Beirut, where he continued to take on assignments for AP. Although he had spent the last few summers back in Rome working at IFAD, this year he decided against it. He said it was just too hard being separated for months at time from his daughter. Those of us at IFAD who knew Simone will miss him deeply. Our sincere condolences go to his family and his many friends around the world.